Berlin-based visual artist / composer duo The Ebertbrothers first started collaborating back in 2006, and in the ensuing years they’ve continued to refine their combination of visual and sound performances, with several download-only self released live recordings already under their belts. 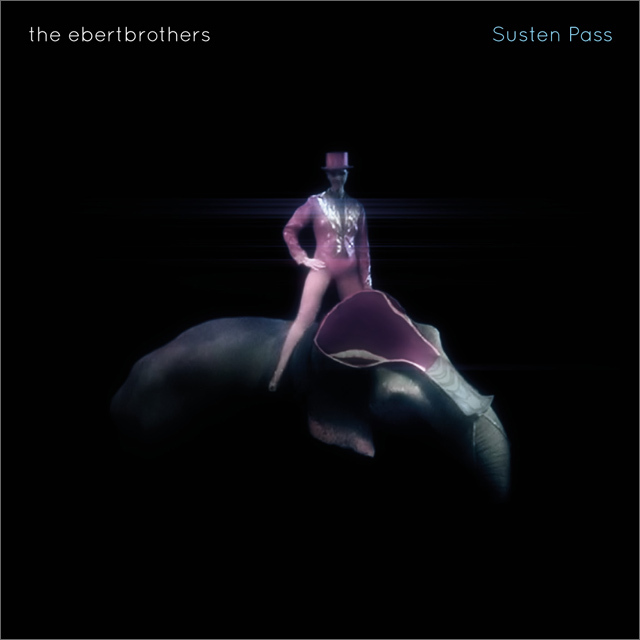 This debut album ‘Susten Pass’ represents The Ebertbrothers’ first physical release, with the 19 tracks collected here being inspired by a year spent playing live gigs throughout Europe during 2010. It’s also a collection that immediately reveals the duo’s evocative, cinematic bent from the very outset, with the predominant mood being sweeping ambience and dark, broken post-IDM electronics along the lines of Bitcrush and Undermathic. Opening track ‘Cave Diving Tonight’s certainly lives up to its subterranean title, sending a complex web of ‘Bucephalus Bouncing Ball’-style corkscrewing rhythms spinning and ricocheting against a serene backdrop of deep sub-bass tones, gaseous ambient textures and smooth, almost soulful synth pads, before ‘Risc Assembler’ injects more of a crisp rhythmic snap, sending vocal fragments darting and rippling against an eerie backdrop of rigid electro rhythms and squelching analogue bass tones, in an offering that leans far closer to the likes of Ceephax or Luke Vibert. Elsewhere, ‘Feature Film’ sees the darkness being turned back up a few notches as eerie dubbed-out tones growl and reverberate alongside dry, clicking rhythms and brooding bass synths, the beats suddenly reversing mid-stride before exploding forth into a chaotic fusillade of breakbeats over layers of glacial synths, while ‘Commode’ sees rhythmic bursts of distortion pulsing against glittering, delicate electronics and phased synths that almost sound like vintage organ tones at points. While at 19 tracks over 76 minutes there’s the occasional sense that things could have been trimmed down here slightly, on the whole ‘Susten Pass’ is an impressive collection of darkly cinematic electronics that’s well worth your time.